Another light novel license to announce! Vertical will publish a novel titled The Seven Deadly Sins: The Seven Scars Left Behind, planned for English release in May 2017. This book was written by Shuka Matsuda, and includes illustrations by Nakaba Suzuki–the creator of The Seven Deadly Sins manga series. It sounds like this light novel is a prequel to the manga. It was released in Japan in October 2015. There are two other light novels for this series in Japan, but no word on a localization for those yet. The manga is available in English courtesy of Kodansha Comics. You can watch the anime adaptation on Netflix. 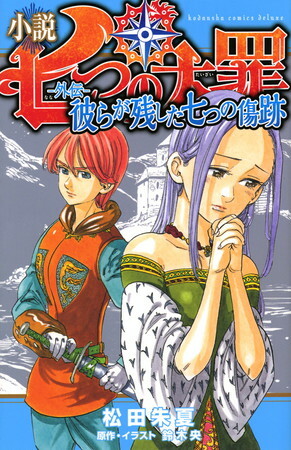 By release order this is actually the second of the gaiden volumes. The volumes seem to be coming out roughly once a year in Japan – the first (Sekijitsu no Outo: Nanatsu no Negai) came out in December 2014, the second (this one – Karera ga Nokoshita Nanatsu no Kizuato) came out in October 2015, and the third (Nanairo no Tsuishoku) is due out in October this year. Aside from that there is also Nanatsu no Taizai: Seven Days, which, unlike these, was published under an actual light novel label (Kodansha Ranobe Bunko), again in December 2014. Thanks for the extra details. It’s interesting that they’re bringing over the second novel volume before the first. Hopefully the stories can stand on their own? I don’t know anything about the actual contents of the volumes, I’m afraid.